For those who know us, we do tend to enjoy some different choices for meats. 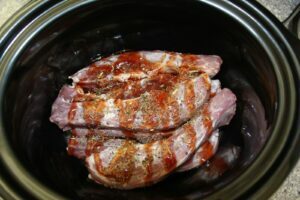 Today’s Sunday supper we are having slow cooker duck necks with cherry chipotle glaze and a bit of coffee rub. By the time this is done, the meat will be falling off the neck bones so we will have something that looks like it has been pulled, like pulled pork. We are serving it with grilled asparagus and a cabbage salad. Duck meat is dark only and is rich in a variety of vitamins and minerals. Heme iron, which is the form of iron in duck and other meats is better absorbed by the body than non-heme iron found in plant foods. Getting plenty of iron and vitamin B12 along with vitamin B6 by eating meats such as duck helps to prevent anemia. I have found as I have gotten older that I require more iron to prevent fatigue and to have more more sustainable energy, so duck, other poultry and fish really meets my iron needs, plus Jack and I love the taste of duck. The duck we buy is from the Farmer’s Market and comes from a trusted source, so we know we are eating non-caged birds that are free-range, with no anti-biotics or growth hormones used. Why not try some duck today?